Burkina Faso became a French colony in 1896. In 1959 the colony gained a status of a self-governing state as the Republic of Upper Volta and joined the Franc-African Community. The country received full independence from France in 1960. The first twenty years of independence were smeared with political rivals and coups. In January 1983 Capt. Thomas Sankara was appointed Prime Minister of Upper Volta. Internal political struggle and Sankara's left-wing points of view led to his arrest. Capt. Blaise Compaoré made efforts to release him, that resulted in another military coup d'état on August 4, 1983. This coup brought Sankara to power and his government started to implement a series of programs, that included mass-vaccination, expansion of women's rights, anti-desertification projects and encouragement of domestic agricultural consumption. 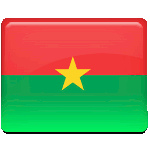 On the same day in 1983 the Republic of Upper Volta changed it's name to Burkina Faso, that is used nowadays. The name of the country may be translated into English as “Land of the honest people”.